Thanks for visiting our site and considering a proposal! We hope that you will find the additional information on this page useful as you prepare your designs. We are incredibly excited to bring new playground equipment to Riverside Park and we are happy to have you along in this journey! This playground will be replacing a wooden castle structure that was cherished by our community. We'd love to modernize yet recreate that vibe through a network of towers, bridges and climbers. The following provides some examples of the type of look we are going for. A large, multi-deck tower(s) is a critical component to the play area along with an abundant amount of unique climbers and slides that create an engaging environment for children. The following are just some examples of what we have in mind but please be creative! We're looking to create a playground that is aesthetically pleasing but also captures the joy, imagination and sense of wonder from the visiting youth! The local elementary students brainstormed ideas last fall for what they'd most like to engage with on their brand new city playground. We found they really wanted to slide, climb and swing so five play pieces were proposed for them to then vote on their favorite. As you can see from the pictures, the 'Ninja Warrior Zone' was a very popular choice! This zone will be standalone from the main tower structure. It should feature a variety of monkey bars, climbers, nets, a monorail/glider/trackrider, swinging/hanging components and whatever else you think they'd enjoy. We envision a lot of unstructured play where a child's imagination can run free. The following are examples of what a 'Ninja Warrior Zone' might look like but by all means, let your creative inner ninja be your design guide! This play area will eventually be encompassed within a natural playscape that will strive to reengage youth with their natural environments. 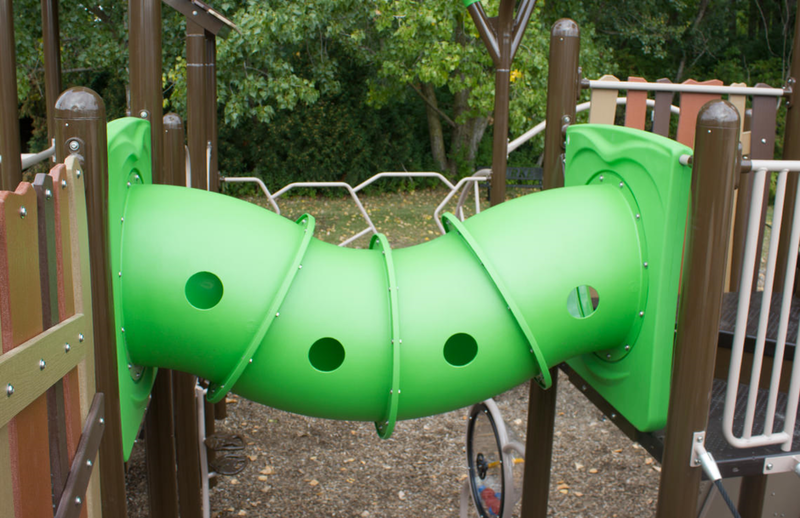 In turn, we'd like the color of this playground to tie in with a natural vibe while still maintaining a modern style. More specifically, we'd look for green, browns, tans, greys to provide the bulk of the coloring. To top it off though, we imagine splashes of neon green and/or other bright colors may allow the play area to also have a hip, modern feel. As this was a wooden castle play area prior to this redevelopment, a hint of wood paneling (recycled plastic, of course) might also be a nice touch too! Keep in mind that the following examples are to give you an idea on color, not necessarily on scope of play.